Arden was designed for today’s way of life, from the state-of-the-art amenities that encourage a healthy lifestyle to the progressive home designs that make everyday life easier. Arden’s home builders know exactly what today’s homebuyers are looking for and incorporate innovative features into each and every home they build. From home automation to flex spaces, here are five of this year’s hottest new home trends, all of which can be found at Arden. Homebuyers today are turning away from homes that feel compartmentalized and restrictive. 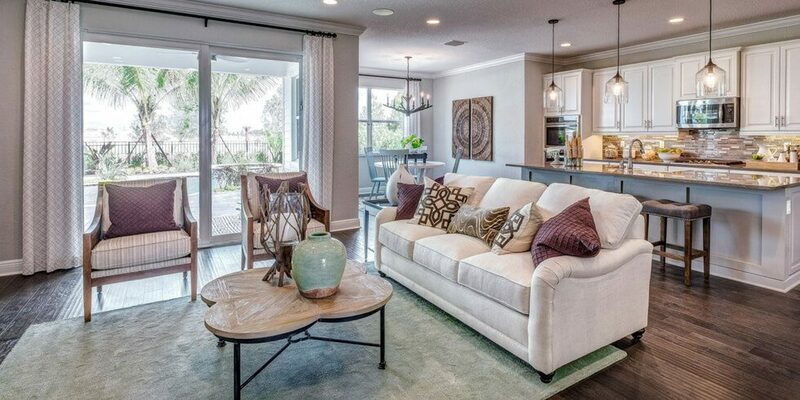 That’s why homes at Arden feature wide open floor plans that feel breezy and bright. Spacious kitchens flow naturally into cozy living and dining areas, making for effortless entertaining and family time. Plus, open concept homes provide you with more flexibility to arrange your space in a way that works best for your family. At Arden, many homes feature a flex space that can be adapted to meet your family’s changing needs. Work from home? Turn it into an office where you can get some work done in a distraction-free environment. Baby on the way? Convert it into a nursery and then a playroom as your kids grow. No space for your hobbies? Whether it’s a craft room, your very own library or a home theatre for movie marathons, you can finally have a dedicated space for the things that matter most to you. Most homes at Arden feature either a front or back porch, or both. These expand your home’s living space and make it easier than ever to enjoy Florida’s natural beauty. Host a neighborhood barbecue, watch the kids practice soccer, read a book with a glass of iced tea, or just sit back and enjoy the sound of crickets at night. And since many of the homes at Arden have the option to extend the back porch, you can include a summer kitchen, perfect for afternoons spent by the pool with family and friends. Arden’s builders are bringing homebuyers into the Jetsons Age with home automation and technologically advanced features available in many homes. Keyless entry, a video doorbell, a Wi-Fi thermostat and products controlled by Amazon Alexa are just a few of the innovative options. To take it even further, Arden residents can choose from some of the world’s first Wi-Fi Certified™ Home Designs, so you can rest assured that all of your devices work throughout your whole home with no dead spots. One of Arden’s founding principles includes stewardship of the land, so it’s no surprise that the homes here include energy-efficient features that reduce the impact on the environment. Programmable thermostats, better insulation, tankless water heaters, ENERGY STAR® appliances and high-efficiency HVAC systems are just a few of the green options available that can help save you money and the environment at the same time. Want to learn more about the forward-looking lifestyle and modern home designs at Arden? Visit our model homes seven days a week, and join our Founders Club to receive news and updates.